The world’s worst online oppressors are using an array of tactics, some reflecting astonishing levels of sophistication, others reminiscent of old-school techniques. From China’s high-level malware attacks to Syria’s brute-force imprisonments, this may be only the dawn of online oppression. In reporting news from the world’s most troubled nations, journalists have made a seismic shift this year in their reliance on the Internet and other digital tools. Blogging, video sharing, text messaging, and live-streaming from cellphones brought images of popular unrest from the central square of Cairo and the main boulevard of Tunis to the rest of the world. Yet the technology used to report the news has been matched in many ways by the tools used to suppress information. Many of the oppressors’ tactics show an increasing sophistication, from the state-supported email in China designed to take over journalists’ personal computers, to the carefully timed cyber-attacks on news websites in Belarus. Still other tools in the oppressor’s kit are as old as the press itself, including imprisonment of online writers in Syria, and the use of violence against bloggers in Russia. To mark World Press Freedom Day, May 3, the Committee to Protect Journalists is examining the 10 prevailing tactics of online oppression worldwide and the countries that have taken the lead in their use. What is most surprising about these Online Oppressors is not who they are—they are all nations with long records of repression—but how swiftly they adapted old strategies to the online world. In two nations we cite, Egypt and Tunisia, the regimes have changed, but their successors have not categorically broken with past repressive practices. The tactics of other nations—such as Iran, which employs sophisticated tools to destroy anti-censorship technology, and Ethiopia, which exerts monopolistic control over the Internet—are being watched, and emulated, by repressive regimes worldwide. Here are the 10 prevalent tools for online oppression. Many countries censor online news sources, using domestic Internet service providers and international Internet gateways to enforce website blacklists and to block citizens from using certain keywords. Since the disputed 2009 presidential election, however,Iran has dramatically increased the sophistication of its Web blocking, as well as its efforts to destroy tools that allow journalists to access or host online content. In January 2011, the designers of Tor, a privacy and censorship circumvention tool, detected that the country’s censors were using new, highly advanced techniques to identify and disable anti-censorship software. In October, blogger Hossein Ronaghi Maleki was sentenced to 15 years imprisonment for allegedly developing such anti-filtering software and hosting other Iranian bloggers. The government’s treatment of reporters has been among the worst in the world; Iran and China topped CPJ’s 2010 list of worst jailers of the press, with 34 imprisoned apiece. But by investing in new technology to block the Net and actively persecuting those who circumvent such restrictions, Iran has raised the bar worldwide. Permanent filtering of popular websites often encourages users to find ways around the censor. As a result, many repressive regimes attack websites only at strategically vital moments. In Belarus, the online opposition outlet Charter 97 predicted that its site would be disabled during the December presidential election. Indeed it was: On Election Day, the site was taken down by a denial-of-service, or DOS, attack. A DOS attack prevents a website from functioning normally by overloading its host server with external communications requests. According to local reports, users of the Belarusian national ISP attempting to visit Charter 97 were separately redirected to a fake site created by an unknown party. The election, conducted without the scrutiny of critical outlets like Charter 97, was marred by secretive vote-counting practices, international observers said. Technological measures were not the only attacks on Charter 97: The site’s offices were raided on the eve of the election, and editors were beaten, arrested, and threatened. In September 2010, the site’s founder, Aleh Byabenin, was found hanged under suspicious circumstances. High-tech attacks against Internet journalists aren’t needed if access barely exists. In Cuba, government policies have left domestic Internet infrastructure severely restricted. Only a small fraction of the population is permitted to use the Internet at home, with the vast majority required to use state-controlled access points with identity checks, heavy surveillance, and restrictions on access to non-Cuban sites. To post or read independent news, online journalists go to cybercafes and use official Internet accounts that are traded on the black market. Those who do get around the many obstacles face other problems. 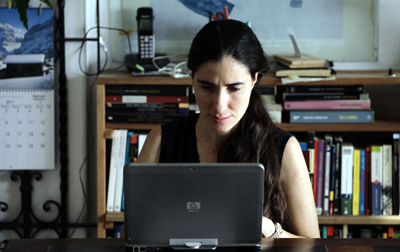 Prominent bloggers such as Yoani Sánchez have been smeared in a medium accessible by all Cubans: state-run television. Cuba and Venezuela recently announced the start of a new fiber-optic cable connection between the two countries that promises to increase Cuba’s international connectivity. But it’s unclear whether the general public will benefit from connectivity improvements any time soon. Telecommunications systems in many countries are closely tied to the government, providing a powerful way to control new media. In Ethiopia, a state-owned telecommunications company has monopoly control over Internet access and fixed and mobile phone lines. Despite a management and rebranding deal with France Telecom in 2010, the government still owns and directs Ethio Telecom, allowing it to censor when and where it sees fit. OpenNet Initiative, a global academic project that monitors filtering and surveillance, says Ethiopia conducts “substantial” filtering of political news. This matches Ethiopia’s continuing crackdown on offline journalists, four of whom are imprisoned for their work, according to CPJ records. Ethiopian government control does not simply extend to phone lines and Internet access. The country has also invested in extensive satellite-jamming technology to prevent citizens from receiving news from foreign sources such as the Amharic-language services of the U.S. government-funded Voice of America and the German public broadcaster Deutsche Welle. For journalists who have been run out of their own country, the Internet is a lifeline that enables them to continue reporting news and commentary about their homeland. But exile-run news sites still face censorship and obstruction, much of it perpetrated by home governments or their surrogates. Exile-run sites that cover news in Burma face regular denial-of-service attacks. The Thailand-based news outlet Irrawaddy, the India-basedMizzima news agency, and Norway’s Democratic Voice of Burma have all experienced attacks that disabled or slowed their websites. The attacks are often timed around sensitive political milestones such as the anniversary of the Saffron Revolution, a 2007 monk-led, anti-government protest that was violently suppressed. Burmese authorities have coupled these technical attacks with brute-force repression. Exile-run news sites depend on undercover, in-country journalists, who surreptitiously file their reports. This undercover work comes with extreme risk: At least five journalists for Democratic Voice of Burma were serving lengthy prison terms for their work when CPJ conducted its annual worldwide survey in December 2010. Harmful software can be concealed in apparently legitimate emails and sent to a journalist’s private account with a convincing but fake cover message. If opened by the reporter, the software will install itself on a personal computer and be used remotely to spy on the reporter’s other communications, steal his or her confidential documents, and even commandeer the computer for online attacks on other targets. Journalists reporting in and about China have been victims of these attacks, known as “spear-phishing,” in a pattern that strongly indicates the targets were chosen for their work. Attacks coincided with the 2010 Nobel Peace Prize award to imprisoned writer and human rights defender Liu Xiaobo, and official suppression of news reports describing unrest in the Middle East. Computer security experts such as those at Metalab Asia and SecDev have found such software is aimed specifically at reporters, dissidents, and non-governmental organizations. Desperately clinging to power, President Hosni Mubarak shut down the Internet in Egyptin January 2011, preventing online journalists from reporting to the world, and Egyptian viewers from accessing online news sources. Egypt was not the first to sever its link to the Internet to restrict news coverage: Internet access in Burma was shut down during a revolt in 2007, and the Xinjiang region of China had either limited or no access during ethnic unrest in 2010. Mubarak’s crumbling government could not sustain its ban for long; online access returned about a week later. But the tactic of slowing or disrupting Net access has been emulated since that time by governments in Libya and Bahrain, which have also faced popular revolt. Despite the fall of the Mubarak regime, the transitional military government has shown its own repressive tendencies. In April, a political blogger was sentenced to three years in prison for insulting authorities. Despite the spread of high-tech attacks on online journalism, arbitrary detention remains the easiest way to disrupt new media. Bloggers and online reporters made up nearly half of CPJ’s 2010 tally of imprisoned journalists. Syria remains one of the world’s most dangerous places to blog due to repeated cases of short- and long-term detention. Ruling behind closed doors in February, a Syrian court sentenced blogger Tal al-Mallohi to five years of imprisonment. She was 19 when first arrested in 2009. Al-Mallohi’s blog discussed Palestinian rights, the frustrations of Arab citizens with their governments, and what she perceived to be the stagnation of the Arab world. In March, online journalist Khaled Elekhetyar was detained for a week, while veteran blogger Ahmad Abu al-Khair was detained for the second time in two months. In countries with high rates of anti-press violence, online journalists have become the latest targets. In Russia, a brutal November 2010 attack left the prominent business reporter and blogger Oleg Kashin so badly injured he was placed in an induced coma for a time. No arrests have been made in the Moscow attack, which is reflective of Russia’s poor overall record in solving anti-press assaults. The attack on Kashin was the most recent in a string of assaults against Web journalists that include a 2009 attack on Mikhail Afanasyev, editor of an online magazine in Siberia, and a 2008 murder of website publisher Magomed Yevloyev in Ingushetia. * Danny O’Brien, CPJ’s San Francisco-based CPJ Internet advocacy coordinator, has worked globally as a journalist and activist covering technology and digital rights.